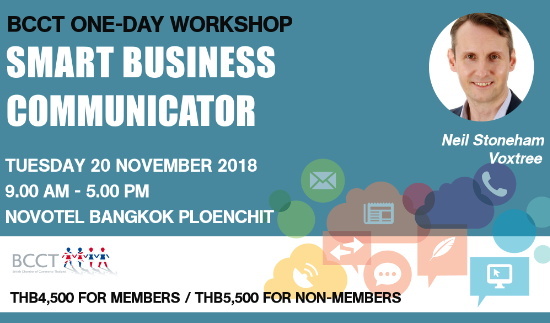 The one-day Smart Business Communicator course gives you the tools to become a confident, effective communicator. You will learn how to boost your communication skills and avoid common communication errors while practising how to get it right. Cost: THB 4,500 net for members and THB 5,500 for non-members. This fee is inclusive of VAT, course materials, buffet lunch and coffee break. Cancellation policy: BCCT is not able to refund for any cancellations after 5.00 pm on Friday 16th November. The ability to communicate clearly and effectively is a crucial skill. It helps the business run smoothly and creates positive relationships with your clients, so your company can enjoy strong sales and growth. On the other hand, miscommunication costs you time and money spent dealing with mistakes and, potentially, your reputation. Business professionals who want to be more effective communicators in English. What makes you a smart communicator? Understand what good communication looks and sounds like. See and hear real-life examples of what works (and what does not). Learn how to explain and describe what you mean so that you are understood perfectly. And make it concise, so that you get to the point! What tone should you use in different situations? How to do you communicate sensitive or difficult information? How do you get people to do what you want? How do you make sure you get a response to your emails? How do you get clients to say ‘yes’? Neil Stoneham is the managing director of Voxtree – a global communications consultancy with clients in many countries, including Thailand. Throughout his varied career, Neil has delivered writing workshops to a number of high-profile organisations such as the British Chamber of Commerce, RBS, Hard Rock and the British Embassy. He has also written for major brands as well as publications such as The Bangkok Post and The Weekly Telegraph.